Jordan Hufangel and James Crowe are a couple soft dudes who have left portland oregon and their loved ones to make a long journey to Patagonia and back. 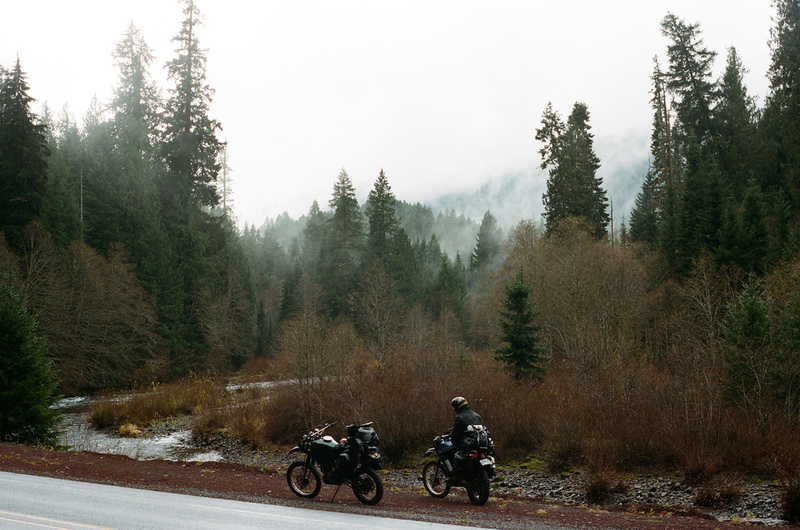 James and I have at long last begun this motorcycle odyssey that we have been working so hard to make happen. Portland to Patagonia and back again. The 'back again' part of the trip has taken on all new meaning since the idea for the trip was first hatched. What was in the beginning an open ended journey that could land us anywhere, now has a definite destination. We have both fallen in love with two very special and supportive women and I will be getting married next fall to the love of my life. So, while we had all been preparing for this day for quiet some time and are incredibly excited to see where it takes us, it was a heavy and emotion filled day. I found myself counting each thing I did and acknowledging that it was going to be the last time I'd get to do that in quiet a while. Snuggling Tabitha in the morning, swinging Bea (Tabitha's daughter) on the swing I made her in the front yard, taking Bea to school, showering with Tab, making love, holding her hand and rubbing the engagement ring that once was my grandmothers, and so on. Bea who is an incredible vessel of truth and clarity, seeing the emotion in my face when she got back from school told me "Don't be sad Jordan, be happy that when you get back you get to marry my mom!" Thanks Bea. After taking the afternoon to be alone with each other, I left Tab around 2:30pm. I was glad to have a short motorcycle ride to dry out a bit before meeting up with James at our friend Blake's shop and heading out. When I got to the shop Blake and our pal Bryan were there to see us off, along with my sister Jen and James' girlfriend Amanda. After my emotional departure from Tab, I didn't envy James for having to do that in the presence of others. We finally pulled away from Blake's a bit after 4 and used our night time ride into the heart of the Cascades to reflect on all that was going on. Agreeing that none of this was worth it if we didn't make sure to have the most amazing trip, we made a pact to do just that. On a random dirt road pull out off highway 21 we set up the tents that will be our homes for the better part of the next year and dreamed of all the amazingness that this trip is going to be.